Soft and pillowy melt in your mouth Sweet Potato Gnocchi are made with ricotta and parmesan cheeses and flour binding the dumplings together. 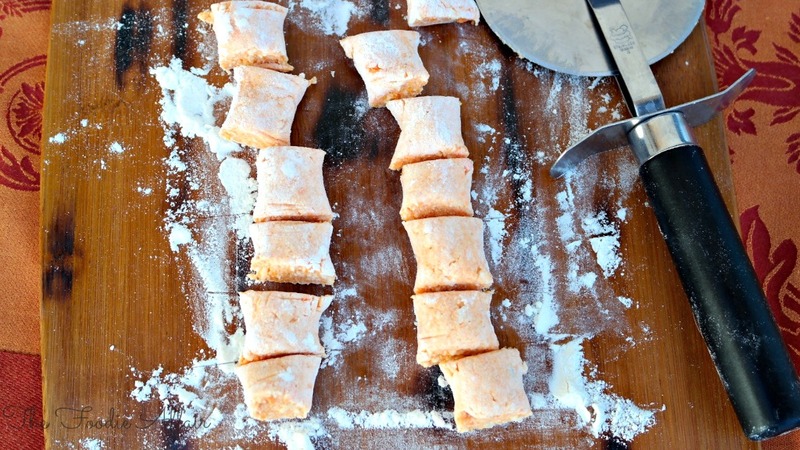 Have you had homemade gnocchi before? I’ve ordered them at a restaurant on several occasions and have always been amazed by how filling the little dumplings are. I’ve also bought them pre-made, but those are usually hard and chewy, and you’ll want to lather them in some type of a sauce. They’re not bad, but they definitely don’t melt in your mouth like these do! I served Sweet Potato Gnocchi three different times in the past month. We love these little guys! It’s taken me awhile to share this recipe because during the Fall I start to lose the natural sunlight that I rely on so heavily for decent photos. Plus rain, gusts of wind…all factors that prevent me from always getting blog-worthy photos. California is in desperate need of a good soaking, so even if the rain isn’t always timely, I’m finding ways to work around those issues. I froze a portion of the dough and waited for Mr. Sunshine so I could share some of the details. By the way, it was very convenient to have the dough ready ahead of time, so take note even if you’re not taking food photos! The tip I have to ensure light gnocchi is to take as much moisture out of the ricotta as you can. I put the cheese on several layers of paper towels and lightly pressed on top of the ricotta with more paper towels repeating the process a couple of times. Also, use the amount of flour listed as a guideline. In one of my batches I only used 2/3 cups of flour. You don’t want the dough too sticky, but go easy on the flour and add a couple of tablespoons at a time. Pictured is one portion out of the three that this recipe makes, so you can cook up just what you plan on using and make more at a different time. If the gnocchi is a side dish, 5-6 pieces per person is satisfying. There is actually a really cool gnocchi board that you can use to form the grooves in the gnocchi., but you can also use a grater or the tines of a fork to make the same indentations. I think it kind of looks rustic with the grooves, and wish the shape would have been more prominent. 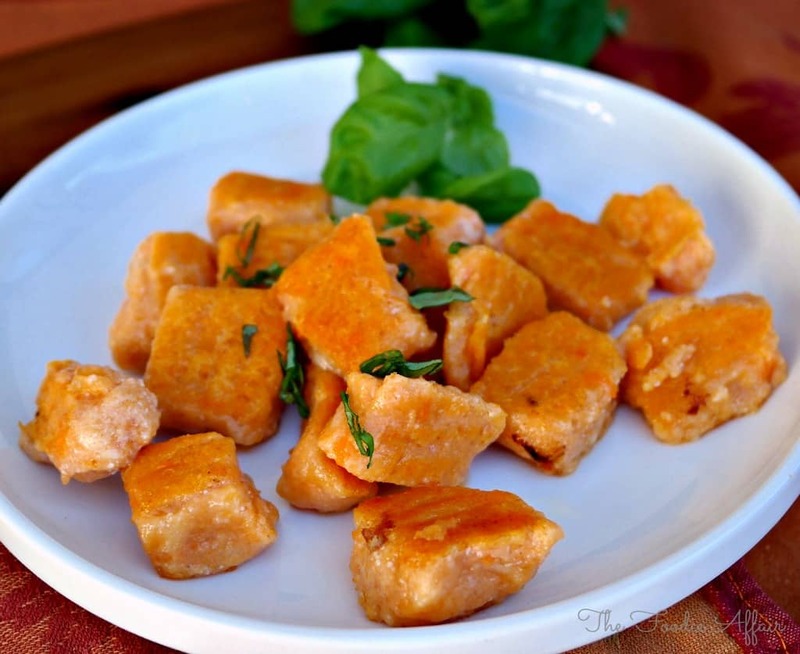 Sweet Potato Gnocchi are rich and filling and don’t need much to accompany them. We ate them just out of the pan sautéed with a mix of oil and butter along with pork tenderloin. I also put these in a skillet dish that I will be sharing with you in my next post! Bring a large pot of water to a boil, adding 1 tablespoon of salt. In a medium bowl mix sweet potatoes and ricotta cheese together mixing well. Add parmesan cheese and nutmeg. Mix in flour starting with a 1/4 cup. Add a tablespoon at a time until a soft dough forms. Divide dough into three portions. On a floured surface roll the dough forming a long rope that is about 1/2 in diameter. Cut each rope into 20 pieces. Add the indentation if you would like using a fork. Place gnocchi in boiling water (up to 10 at a time. Don't over crowd). Stir once to ensure gnocchi doesn't stick to the bottom. When the gnocchi floats to the top, let it simmer another minute. Remove with a slotted spoon and place on a baking sheet. Repeat until all gnocchi is cooked and let cool. In a large skillet over medium-high heat add 1 tablespoon of olive oil and 1 tablespoon of butter. When melted, gently add gnocchi and saute until a light crust forms. Turn once. Keep warm and repeat process for remaining gnocchi. I prefer roasting my sweet potatoes. Clean and pierce potatoes with a fork. Put on a baking sheet and roast at 400 degrees for 1 hour or until a fork and easily pierce the potato. Let cook and cut in half lengthwise. Remove pulp and mash with a potato masher or pulse in a food processor. Adapted from Epicurious, Sweet Potato Gnocchi with Brown Butter and Sage. Hi Sandra, gnocchi is something I love to eat in restaurants. It looks difficult to make but your recipe looks like it’s something I think I can do. I will give it a try and let you know how it comes out! Looks yummy! I haven’t made gnocchi in a long time, but we have a recipe coming up for French Fridays with Dorie. I’d love to try your sweet potato version, too! The color is amazing! 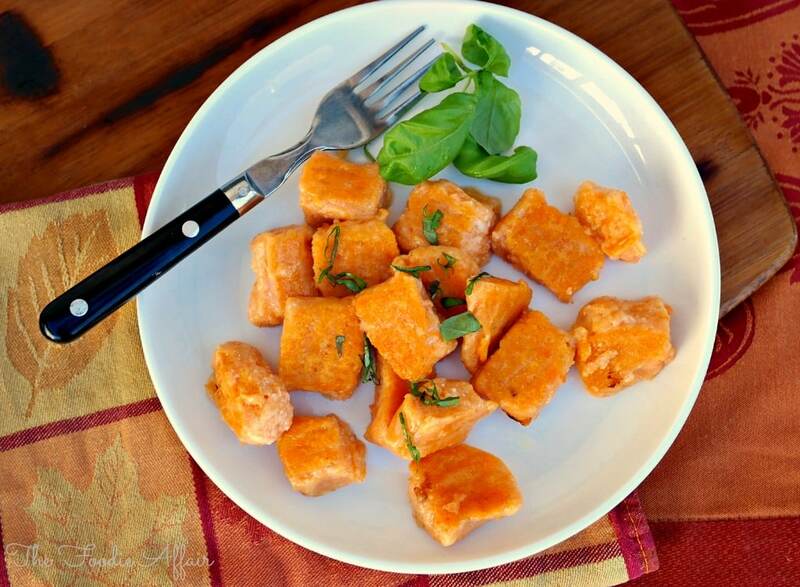 I love the way the gnocchi made with sweet potatoes just pop off the plate and says, eat me! You make making gnocchi doable thanks for the easy recipe. My pleasure to pass along a tasty dish, Norma! I love homemade gnocchi. Like little soft pillows of heaven. I’ve only ever made some using yukon gold potatoes, so I would def love to give these a try! 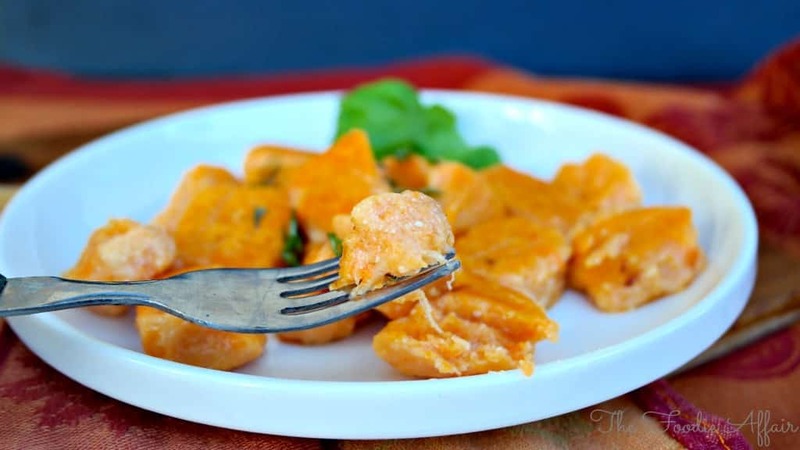 I would love to hear what you think if you give the sweet potato gnocchi a try! These look and sound incredible! Such a great recipe! 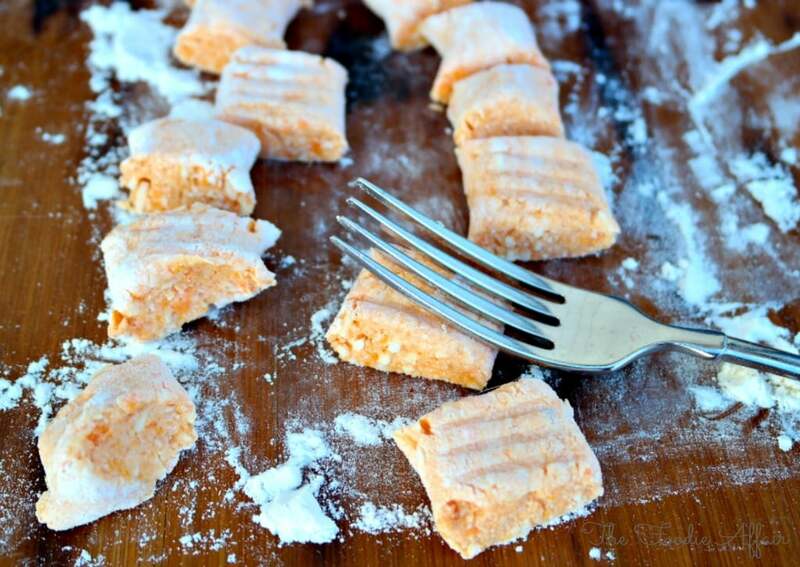 Sweet potato gnocchi are one of my faves! Yours look fantastic…. Thanks so much! Sweet potato is one of my favorites too! Drooling! I really need to try these asap! They look really fun to make. I think this would be a fun to open a bottle of Chianti, gather everyone around a table and make gnocchi! They look so easy and sound so delicious!I love all types of gnocchi! Gnocchi is super filling too and I love that you can stretch the dumplings adding them so many meals! Oh wow, I have never actually seen the process of gnocchi made before. Great to see those photos of what it looks like before it’s final form. That orange colour is so pretty, I will have to try these, such a great alternative to standard potatoes! I have made homemade gnocchi before and I absolutely LOVE it 🙂 Yours lookds delicious! Thank you, Shelby! I think I’ll be creating more dishes with gnocchi in it. It has become such a favorite! These are tasty, Carrie and I bet your little one would gobble these up too! I’ve never made homemade gnocchi. Definitely pinning your recipe to try sometime. It’s an easy recipe, Tammy! Thank you for pinning! I love gnocchi when they are light as air which is hard to get even in a good Italian restaurant. I’ll be giving yours a try over the fall or winter…they will add pretty color to the plate on a cold gray day. The orange color from the sweet potatoes really does brighten up a plate! I order gnocchi all the time at restaurants but have never made it. Your photos are encouraging me to give it a try! I’d love to try the sweet potato variety. Haha! I can totally see why it might be difficult to make because you don’t want the dumplings to be heavy with flour. Those shows are so fun to watch! My dad lived in Italy for a while, and he love gnocchi, I think I will make this for him! That would be a nice surprise for your dad! I hope he likes this sweet potato version of gnocchi! 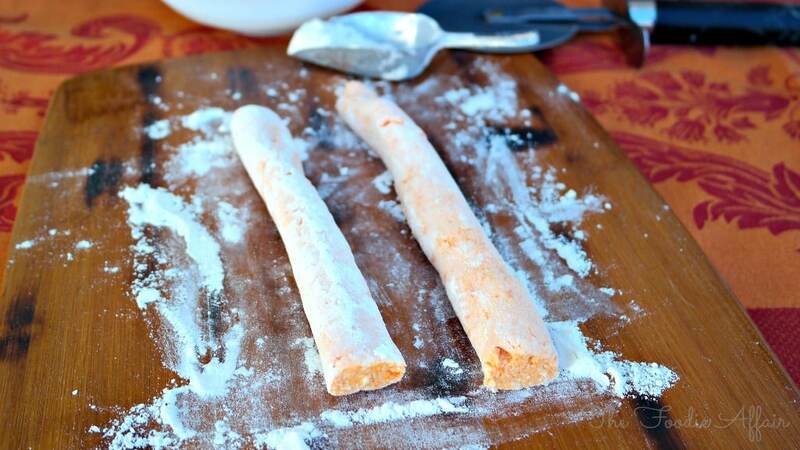 Homemade Sweet Potato Gnocchi sounds remarkable! I am totally in love with this idea!! Homemade gnocchi melts in your mouth. It’s the best, and the sweet potatoes are so colorful and tasty! I have never made homemade gnocchi before but have always wanted to. Your recipe looks delicious, can’t wait to try it! It’s really easy to make, Jen! You can get real creative with a gnocchi dish too. Would love to see what you cook up! I struggle making the perfect gnocchi, yours looks amazing! Brilliant color! Isn’t the gnocchi pretty! 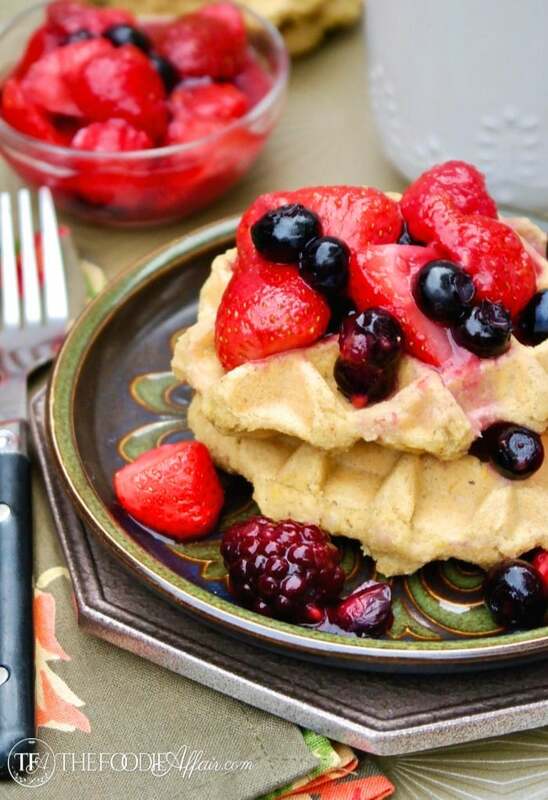 I love colorful tasty foods. I think you’ll have success with this recipe, Jessica. I’ve seen you so much on Google+ and love your recipes but I don’t think I’ve visited your blog before! How gorgeous is it here – wow. You have so many beautiful dishes and I love that you include sinful ones as well. I’m going to start to do the same, lol. I’m going to follow you on FB too so I don’t miss a thing. Thanks so much for your kind words at Bobbi’s blog! Hope you’re having a great weekend.